Short of cash in the holidays, I ended up working for EMAP, a magazine publisher. My next decade was spent living the 'every meeting’s a party' lifestyle. I had 13 different roles in 14 years, from telesales to publishing director. Almost everyone I worked with was living their passion. I loved it. I was headhunted and moved to Barclays, and spent the next five years getting to the point where I wanted nothing more than to find a role with a purpose beyond just making money. In the search for that, I discovered the fabulously innovative, exciting and ethical world of social enterprises. 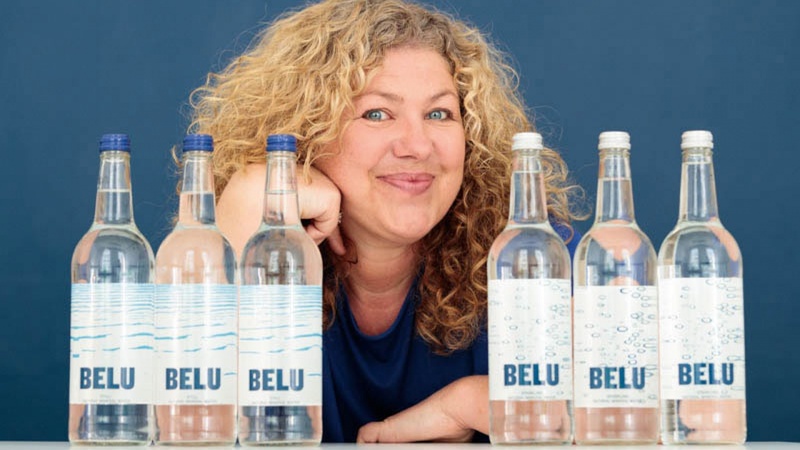 It was 2010, and I was approached to figure out what to do with Belu Water, a debt-laden and struggling mineral water business. In 2011, I became CEO, relaunching the business with a new brand identity and business model, critical to which was our new partnership with the charity WaterAid. The plan was to set environmental standards in the water industry, prove the sustainability of our model by being profitable, and invest 100% of net profits into helping WaterAid reach the millions of people worldwide living without clean water. Sustainability for us isn’t just an add-on – it's at the core of everything we do. Over the years we've set new standards in making bottles from recycled bottles; introducing lightweight designed Ethical Glass, which has a lower carbon footprint; and developing our offering to include water filtration systems, carafes and refillable water bottles. Building this business has been an incredible journey so far. We’ve passed over £3 million to WaterAid to transform lives with clean water, decent toilets and good hygiene, and we’re on track to add another £1 million to that this year alone – no small feat for a team of eight. My top Belu highlight so far is the business receiving The Queen's Award for Enterprise, recognising our achievements in sustainability. And the most liberating thing? It has to be that we’re genuinely focused on trying to help our customers make the most sustainable choice. Reviewing their water model and where we can help reducing their carbon footprint through removing single use bottles where we can and improving choices where the business is dependent on bottled-water revenue. How many brands get to say "Hey, how can we help you buy less of our product?" Nine years on I’m still having a blast at Belu. We’re on a mission to inspire all people that there is a more ethical way to do business. We just happen to do it in water.